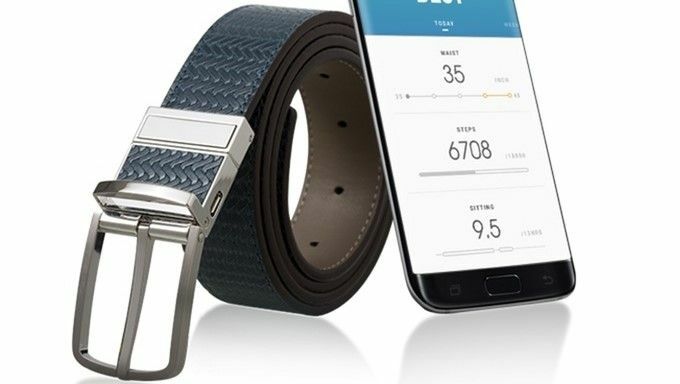 It seems like only yesterday that we featured another unusual wearable bit of tech from Samsung (in fact, it was yesterday) - so it only seems fitting to cover the next unusual bit of smart kit originating from the South Korean multinational - the smart belt. Rising out of Samsung's experimental Creative Lab (and shown off at CES earlier in the year), the design has now been picked up sports tech company Welt and its taken to Kickstarter to get the funding it needs to bring the design to the masses. That design uses a magnetic sensor which tracks where on the belt your waist is currently sitting, with a size range from 28 to 44 supported as standard Along with a step-monitoring pedometer, the data is fed directly into the official Welt app so you can track your decreasing tum with up-to-date measurements. The belt iteself uses Bluetooth 4.1 to keep that data fresh and offers over 20 hours of battery life per full charge. Welt says you can also use the belt to keep an eye on your eating habits, with warnings of over or under-eating built in to keep your diet safe and regular. The design is selling like hot cakes on the crowdfunding site, too, having smashed its $30K goal in a matter of hours. If you're quick you can grab an early bird version of the belt for $99 (£74). Shipping is tentatively set for January 2017.